As you can see, the Protect method of the ProtectedData class takes binary input and returns a byte array that contains the encrypted data. This means that you’ll have to do some conversions when dealing with strings, and the result of the encryption is a byte array anyway. The above methods are convenient to encrypt sensitive data that is supposed to be serialized or transmitted in any way. They do, however, not protect data at runtime as the decrypted strings remain in memory. In case this is an issue, you should revert to the SecureString rather than using plain strings (but keep in mind that this may lure you into a false sense of security!). Attention: Always keep in mind that once you are dealing with a managed string (such as the plainText variable below), your code can be compromised! 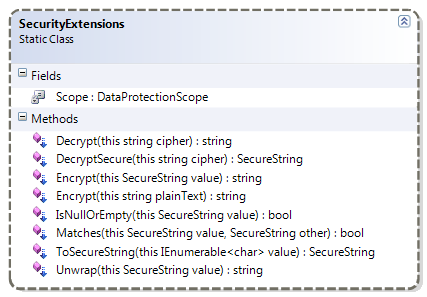 Accordingly, the ToSecureString / Unwrap methods should be treated carefully. Here’s the class that provides the extension methods including a few helper methods that facilitate dealing with SecureString (e.g. SecureString.IsNullOrEmpty). Note that you need to set an assembly reference to the System.Security assembly. Also keep in mind that the class always performs DPAPI encryption with user scope. You might want to provide some additional overloads in order to support encryption that uses the context of the machine rather than the user’s. The same goes for the optional entropy that is not used at all for simplicity. /// Specifies the data protection scope of the DPAPI. /// as a base64 string. /// Decrypts a given string. /// Encrypts the contents of a secure string. /// wrapped into a <see cref="SecureString"/> instance. /// returns the contained value. /// null or has a <see cref="SecureString.Length"/> of 0. /// Performs bytewise comparison of two secure strings. This is great code and very helpful but I am running into an issue that when I pass in a string with a $ in it the content after the $ is not included. I thought it was an encoding issue but changing that had an adverse affect. Thoughts?